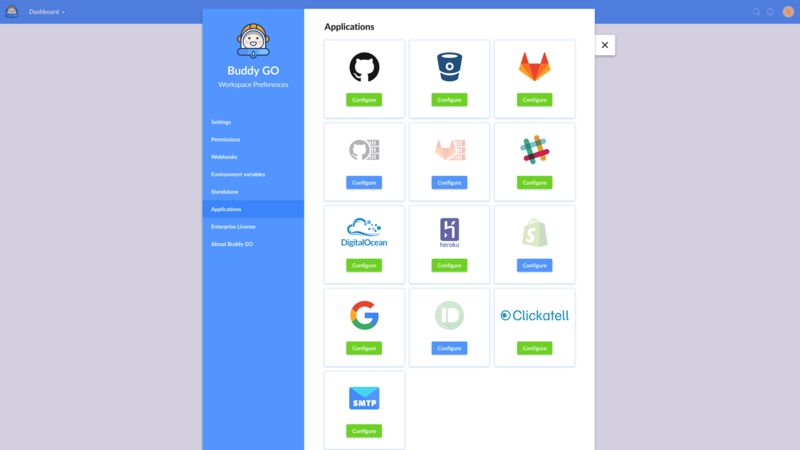 Buddy GO is a fully functional CI server with Docker-based builds for all most popular programming languages and frameworks (yes – yours too) and blazing fast deployments based on changesets. It integrates with GitHub CE/EE, Bitbucket, GitLab CE/EE, AWS, Google, Azure, Heroku, Slack, DigitalOcean, Rackspace, Slack, as well as features DevOps tasks like SSH scripts and website monitoring actions. Click here for instructions how to integrate Buddy GO with your type of service. Buddy Enterprise comes with 30 days of trial after which you need to buy a license (35$ per user, sold in packages of 5). For detailed information about pricing, click here.